To What Extent Do Top Colleges Enroll (or Not Enroll) Latino Students? In a previous blog, I examined colleges that are often referred to as emerging Hispanic-Serving Institutions or emerging HSIs for short, which enroll between 15 to 24 percent Latino students. I discussed indirect evidence that a “critical mass” of Latino students may change the culture, norms, and values of the campus environment in ways beneficial to students in that ethnic group. In particular, more enrollment of Latino students can create a space where students feel included in the college’s community, which research shows increases persistence and completion. There are also benefits to White and other non-Latino students. For instance, research has shown that the learning becomes more robust with distinct viewpoints. Interacting with a diverse group of people provides many opportunities to learn from others who bring a different perspective. A study conducted by researchers at the University of Wisconsin-Madison found that ideas generated by diverse teams were of better quality in terms of feasibility and effectiveness. Diverse teams chose solutions that were more nuanced compared to less diverse teams. As a nation with a growing share of Latino-Americans, we are well-positioned to see benefits associated with ethnic diversity at school and in the workplace. Here, I delve into the share of Latino students at highly selective colleges (like the one I attended). 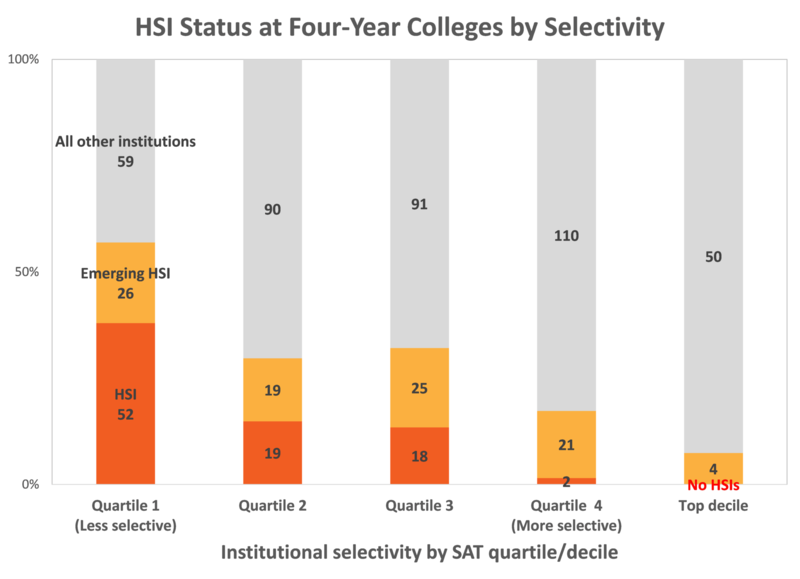 Which elite colleges are emerging HSIs? Note: This chart may exclude some highly selective colleges that do not require students to submit SAT or ACT scores. For instance, although Pitzer College does not report SAT data to the U.S. Department of Education, it is another top college that it enrolls less than 15 percent Latino students (despite being located outside Los Angeles). On the other extreme are colleges in states with higher shares of Latino high school graduates (California, Colorado, Illinois, New Jersey, New York, and Texas) but that enroll relatively few Latino students compared to the overall population (see chart). For example, Colorado School of Mines enrolls seven percent Latino undergraduates in a state where Latinos represent one-quarter of 18 to 24 year-old high school completers. UC-Berkeley falls short of emerging HSI status despite serving California with its hundreds of thousands of graduating Latino high school seniors each year. Additionally, many highly selective private colleges and universities across the country have failed to enroll Latino students. Rice University has a Latino enrollment share of 14 percent — well below the share of Latino high school graduates nationally (21 percent) in its own state of Texas (44 percent). University of Chicago and Princeton are within commuting distance of millions of Latino in Chicago and New York City, respectively, but fewer than 10 percent of their students are Latino (and very few of their teaching faculty are Latino either). Even though elite private colleges have the ability to recruit nationally, they consistently enroll far less than the national percentage of Latino 18 to 24 year-old high school completers. * UC-Berkeley and the Colorado School of Mines are public institutions; ** Percent Latino 18-24 year-olds in state based on three-year ACS estimates from 2013-15. Increasing Latino enrollment at elite colleges is particularly important for a few reasons. First, America’s top colleges disproportionately produce those who have the most influence in business, politics, and other aspects of society. Second, elite institutions typically have more resources than others and are rich with networking opportunities that impact economic outcomes after graduation. Third, since these institutions will churn out many of our future leaders, we want those leaders to be racially and ethnically diverse and have educational experiences that expose them to people who come from different backgrounds and have different experiences and perspectives. What are the benefits of diversity for our college and how does it help us fulfil our school’s educational mission? What is our responsibility in promoting racial, ethnic, and socio-economic diversity in higher education and beyond? What have we done to prioritize ways to better serve Latino students in our evaluation, planning, and allocation of resources? How well have we targeted recruitment and outreach to encourage applications and interest in enrollment among Latino students at both high schools and community colleges? To what extent have we reduced or eliminated consideration of admissions criteria that advantage White and high-income students, such as legacy status, ability to pay full price, and recruitment for varsity sports teams with little racial and ethnic diversity? To what extent have we made admissions reviews more holistic to emphasize factors beyond traditional criteria? How much weight is placed on traditional factors such as grades in college prep courses, grades overall, strength of curriculum, and admissions test scores compared with non-traditional factors such as first generation status, life experience, bilingual fluency, and barriers overcome by the student? How well have we tailored admissions processes to take into consideration the achievement of prospective students in light of challenges they faced in elementary and secondary school? How well have we developed financial aid practices and supports that encourage Latinos to choose to enroll at our institution? How have we made the financial process easier for first-generation college goers and foreign-born Americans? To what extent have we created opportunities to engage and educate parents in English and Spanish around admissions, financial aid and student engagement and support? How much progress have we made in matriculating and retaining Latino students through initiatives such as summer bridge programs? How have we made campus climate and culture more inclusive of Latino students? To what extent do Latino students see people like themselves represented among the teaching faculty and campus leadership? Recruiting, admissions, financial aid, student supports (e.g., mentoring and career advice), and campus climate likely all play a role in how well top colleges attract and serve Latino students. With such little representation of Latinos at top colleges, it is clear that college presidents and leaders need to assess their schools on the above questions and much more. Major changes will be needed so that graduating classes our top colleges better reflect the increasing diversity of our nation. For more information and for additional resources, you can check out A Look at Latino Student Success. Although small in number, there are 21 emerging HSIs and two HSIs in the top SAT quartile that provide access to Latino students. These 23 colleges and universities account for two out of five bachelor’s degrees awarded to Latino students at highly selective colleges. These schools are generally concentrated in states with large numbers of Latino high school graduates and include public universities such as UC Santa Barbara, as well as highly selective private colleges like Stanford and MIT. 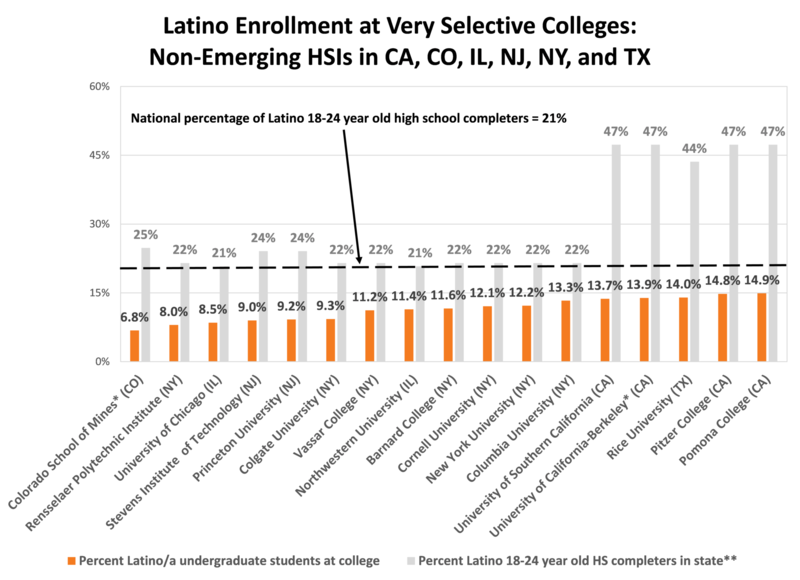 See our blog posts about outcomes at emerging HSIs and Latino enrollment at top colleges. * University of California-Santa Barbara and New Mexico Institute of Mining and Technology are Hispanic-Serving Institutions.